Shell and Emily are a mother and daughter team in Charleston, South Carolina. 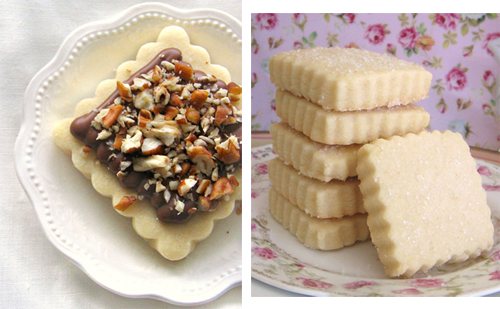 In their little bakery, Butter Blossoms, they create all manner of tea and shortbread cookies. These are perfect for the Christmas munchies...and makes a great hostess gift. Rosemary Pine Nut and Chocolate Espresso shortbread cookies sound simply divine ($13.50). All of Shell and Emily's cookies are baked fresh to order and can be shipped anywhere in the US. There's something to be said for simplicity done well. 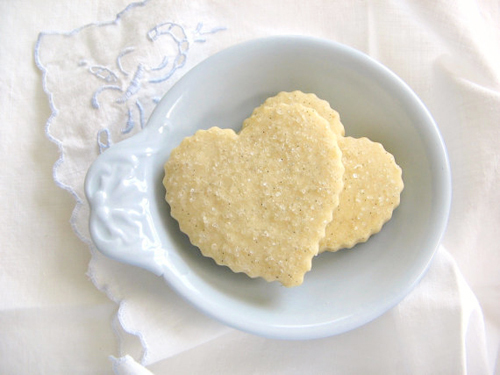 These Vanilla Bean shortbread cookies are filled with hundreds of vanilla bean seeds and finished with a light sprinkling of white sanding sugar. If you live in Atlanta, you'd be remiss if you didn't try the incredibly tasty concoctions of Maggie and Katie Sweeney of Cake Hag. They make the best cakes I have ever tasted, hands down. There are many holiday cakes to choose from but Maggie shared her current top three. The above is their Ginger Spice Apple Berry Cake, made with layers of citrus and ginger cream cheese, carmelized apples and cranberries ($30). Her 14 Layer Cake, pictured left, is Maggie's sponge cake made with premium chocolate and Grand Marnier liqueur ($35). The Buche de Noel, pictured right, is actually a set of two cakes. One is white chocolate with raspberry mousse and dark chocolate ganache (above) that's paired with a milk chocolate with mocha mousse and milk chocolate ganache ($40 for two).